Here's the first piece in a series I've been working on called Guided Motion, based on a generative mixing program I wrote in Pure Data and samples processed in Csound. All source material will be taken from various improvisations on different instruments and maybe other smaller generative programs. This one is from an upright bass improv I recorded when I was working on some ideas for the Many Arms/Toshi sessions back in April. 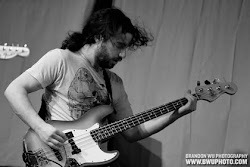 Johnny is a bassist and composer from New York City. He splits much of his musical time pushing the boundaries of avant-rock and free jazz as a member of the guitar trios Many Arms and Zevious. He also leads his own quartet and composes an eclectic mix of chamber and electronic music. Johnny has toured the US and Canada extensively and has released albums on Tzadik, Cuneiform Records, Engine-ESP, Majmua Music, and Abandon Ship Records.